In this month's In Good Faith column I write about the big picture of faith and our tendency to want to focus on the dots. A shout-out to pointillism and the awesomeness of museum gift shops. When I was a kid my parents often dragged me and my brother to museums. It wasn’t just that they were trying to ram some culture down our throats; they were genuinely inspired by art and wanted to share that passion with their children. Much of which was lost on the two of us who whined and complained our way through centuries of magnificent works of art until we reached the great pinnacle of the museum experience: the gift shop. But I remember being fascinated with one particular style of painting known as pointillism. That’s the medium in which small distinct dots are placed in patterns that make up images. When you stand up close all you see is a bunch of dots. But as you back up, the figures and background begin to emerge. At a certain distance you can no longer even tell that there are any dots at all. They blend together to form what looks like a typical painting. 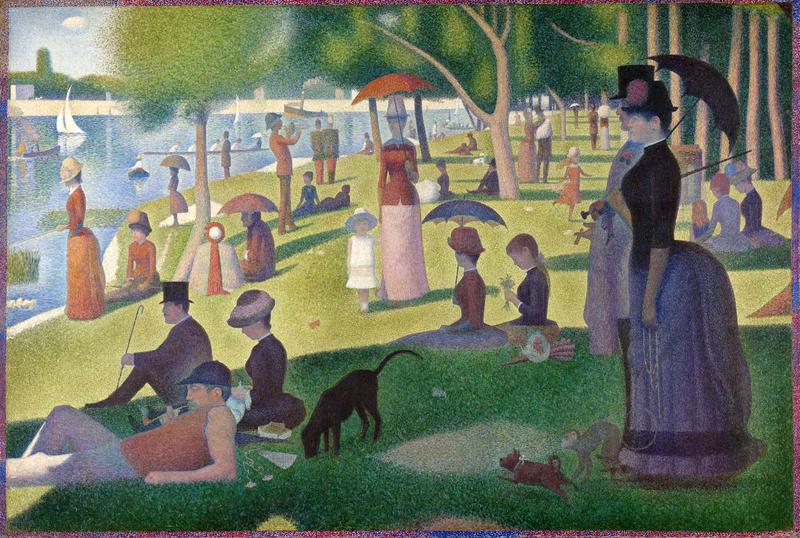 Perhaps the most famous example of pointillism is the late-19th century Georges Seurat painting titled “A Sunday Afternoon on the Island of La Grande Jatte.” It hangs in the Art Institute of Chicago, a place I went to (of my own accord!) a few times when I was attending seminary in Chicago. They have a great gift shop, by the way. I was thinking about this recently as it relates to our lives. So often we focus on the dots while missing the big picture. We get annoyed with our children for spending too much time on the Xbox rather than giving thanks for the gift of their very existence. We get frustrated with the time it takes to attend to the needs of aging parents rather than being grateful for their continued presence in our lives. We focus on doing the dishes rather than enjoying the company of our guests. Much of this is about living a life of gratitude and thanksgiving. That’s the posture of faith; a way of viewing life as a gift from God rather than something to endure or “get through.” And it’s precisely why attending to relationship with the divine makes a difference. God pulls us back, away from the dots of life, allowing us to see things in all their glorious living color. And when we let God do this, the full image of God’s love for us becomes increasingly clear. I still love museum gift shops. And while I no longer see them as sweet relief from the cruel and unusual punishment of being exposed to art, my kids sure do. I can't help commenting that our computer screens and TV sets are modern examples of Pointillism. The millions of pixels that make up the images we see are nothing but points of light on the screen. When there are only a few pixels making up an image, it becomes blurry and we can't make out what we are looking at. When TV shows don't want us to have a clear picture of what we are seeing, they "pixel-ate" the picture. (Ever seen the series "Naked and Afraid"?) Yes, in order to see a true, clear picture, you can't concentrate on a few pixels. In fact, the more pixels there are in a picture, the clearer it becomes. In order to have a High Definition life, I think you need lots of pixels! Moving to another place and deserting your past life, unquestionably offends of the kids and other relative's that are candidly joined with the house. This circumstance can truly make you enthusiastic and focused. Thus, attempt and handle things admirably at this timeframe and fulfill them feel in the new house. This will support up your good and decrease stress when you watch your friends and family cheerful and excited.